An eclectic collection of artists working across mediums and subject matter. Yet they all share a connection to traditional art practices from South Asia. Their work focuses on a range of issues from nature, politics, memory, gender to various other narratives. Executed across a multitude of mediums including painting, photography, miniature and printmaking. 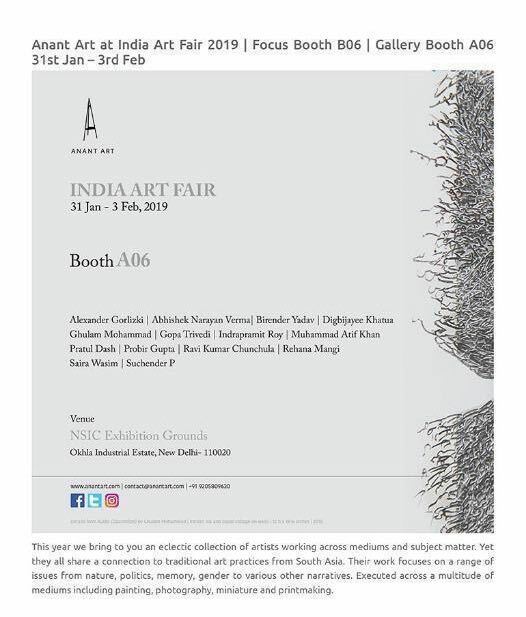 India Art Fair is the leading platform to discover modern and contemporary art from South Asia and a portal to the region’s cultural landscape. GALLERY BOOTH A06 // Alexander Gorlizki // Abhishek Narayan Verma // Birender Yadav // Digbijayee Khatua // Ghulam Mohammad // Gopa Trivedi // Indrapramit Roy // Muhammad Atif Khan // Pratul Dash // Probir Gupta // Ravi Kumar Chunchula // Rehana Mangi // Saira Wasim // Suchender P.